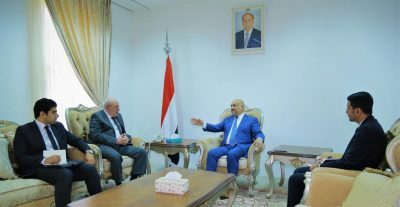 Foreign Minister Khaled Alyemany and the Egyptian ambassador to Yemen Naser Hamdi discussed cooperation between the foreign ministries of both counties especially with regards to training Yemeni diplomats in Egypt. The talks went over the situations of the Yemeni community in Egypt and the Egyptian nationals in Yemen. Alyemany appreciated Egypt’s support to Yemen and receiving Yemenis and hosting them in the hundreds of thousands including those who fled the Houthi continuous war.